Baseball isn’t a big thing here in the UK. 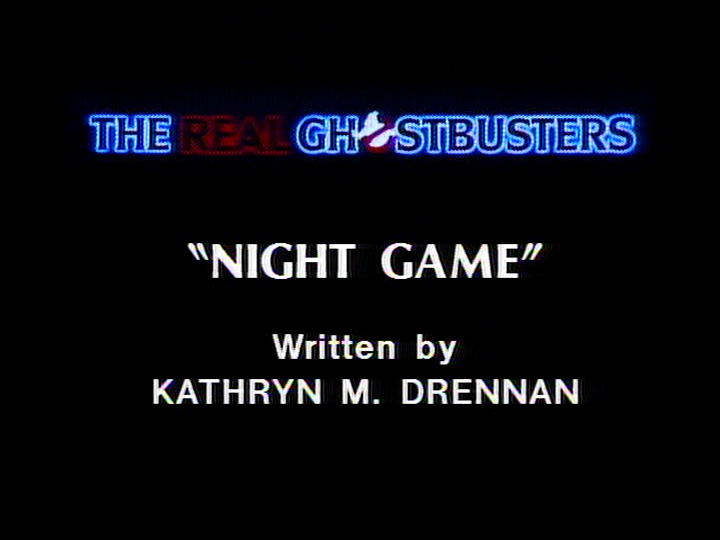 At school we’d play rounders instead, which was the same thing I suppose but a lot less complicated, so my first exposure to the beloved American game was episode twenty-one of The Real Ghostbusters, the always brilliant ‘Night Game’. This was one of two episodes featured on Volume 4 of the series on video tape, and still the most watched VHS title in my house that had anything to do with ghostbusting. To be fair, this was more to do with the other episode on the tape, the terrific ‘Beneath These Streets’, but this adventure got more than its fair share of viewings by default. This is also notable for being an episode that focuses on Winston – the Ghostbusters universe has occasionally short-changed the guy, none more so than in Ghostbusters II, which seemed to still treat him like ‘the fourth one’, not even bothering to invite him for early parts of the action. Okay, so he wasn’t a scientist like the other three, but he was still a Ghostbuster, for God’s sake! 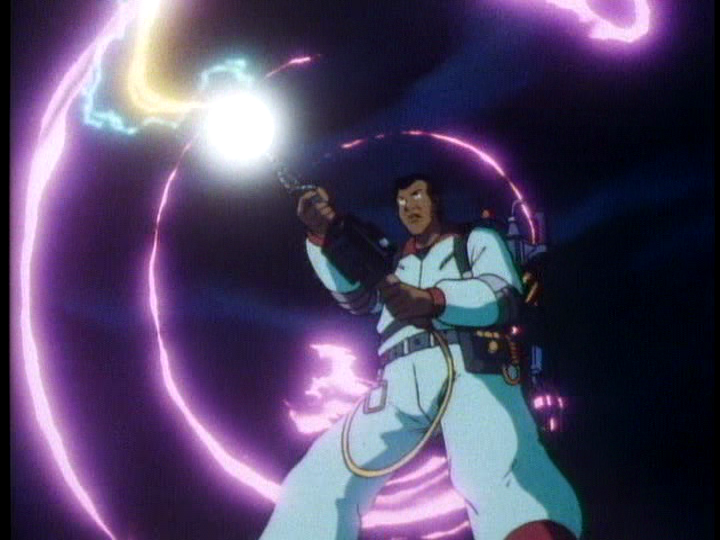 Anyhoo, back to the cartoon – we’ve had some episodes that have focused a little more on individual ghostbusters. Ray’s had ‘Look Homeward, Ray’, Egon’s had ‘Cry Uncle’ and Peter’s going to get some extra time in Episode 22, but now it’s Winston’s turn. Looks like he’s a big baseball fan. Good for him. Before we find out that particular titbit, we visit the local Jaguars stadium at night in a particularly atmospheric opening scene – some creepy shots of the clouds obscuring the moon, the rubbish blowing through the desolation of the stadium… it’s a cool start, and all manner of things supernatural, swirly-whirly, bluey-pinky ectoplasmic are occurring. The pitcher’s stand starts to glow orange and ends up resembling a huge egg yolk…. and then, silence. The next day the Jaguars are set to play, but get this – they’re losers. Winston gets all geared up, dressed-up in Jaguar gear and wants everyone else to come to the game with him. No one’s interested. No one wants to see a team lose. Janine’s not interested. In fact, she seems a little on edge today, slamming the desk quite angrily when Egon passes by and wonders why she made a reference to ‘fungus on the brain’. Never mind, Winston tempts Slimer into coming by promising him shedloads of food – I’d rather go solo, considering the amount of popcorn the little blighter can pack away. I seriously hope Winston was paying for all this junk out of his own pocket and not out of petty cash. The game, which is very dismally attended it must be said – most of the people there are either asleep or reading the paper -is drifting along as normal but weird things start to go down when the pitcher’s ball remains suspended in mid-air, hovering for a bit and then speeding down at an alarming rate, crashing right next to one of the fielders. Winston is deeply concerned, but the others don’t sound convinced – now if the fielder had caught the ball, Peter quips, then that would have been something supernatural. Winston refuses to back down and having done his research, informs the others about the long-standing history of the stadium and it’s occasional spectral interferences. Every five-hundred years, good and evil meet on the site of the stadium to duke it out. Egon’s prepared to entertain Winston’s theories, but not until morning, and no action is to be taken until they get a permit from the mayor. Er, what? Since when has that stopped them going where they want and busting what they want in the past? Saying that, maybe they’re still in deep trouble with the mayor after all of the slime they generated in the previous episode. Winston won’t back down however, and sneaks off in the middle of the night and gets the stadium’s security guard to let him inside. The guard seems deeply chuffed to be meeting a Ghostbuster, and gushes on about how happy he is, only for Winston to rather rudely interrupt him mid-spiel. 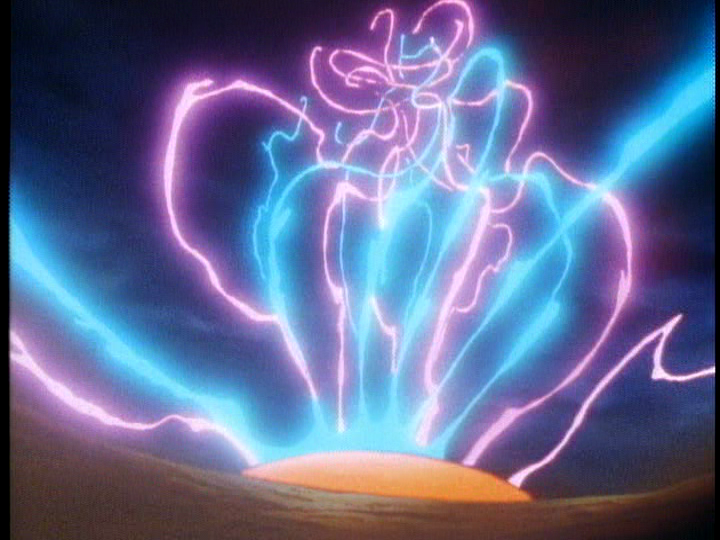 Winston himself is interrupted by the shock of seeing what’s in the stadium – more supernatural swirly-whirliness like at the start of the episode. Winston tells the guard to call the others, and he himself rather foolhardily advances further into the field where all kinds of baseball paraprhenalia is being hurled everywhere by ghosts, receiving a 125mph baseball glove smack in the face in the process, knocking him out! The guys arrive on the scene – screw the permit, I guess – but by the time they arrive, the stadium has been coated with an enormous spectral shield that looks a little like ghostly marmalade. 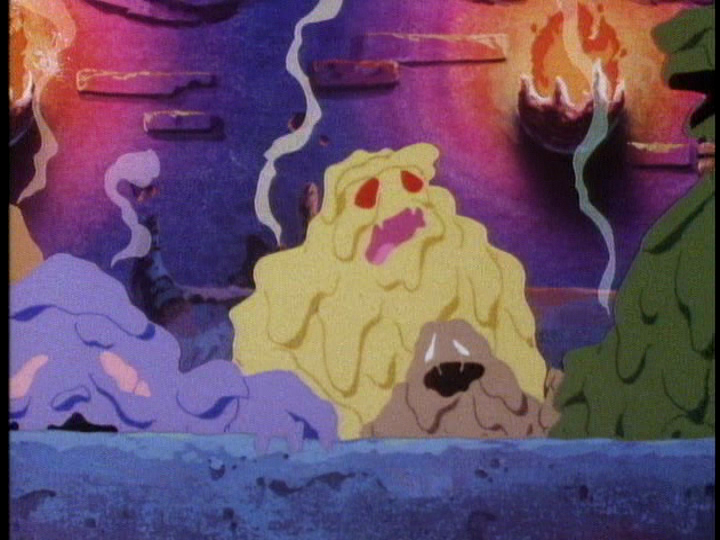 Ghostbusters II would pull off a similar trick a few years later when it coated a whole building in pink slime. The guys do the obvious thing and blast the hell out of the marmalade, which breaks open a hole they can run through, but when they come out the other side, it’s like they’re back in the subterranean nightmare of ‘Knock, Knock”s pre-apocalypse horrors. 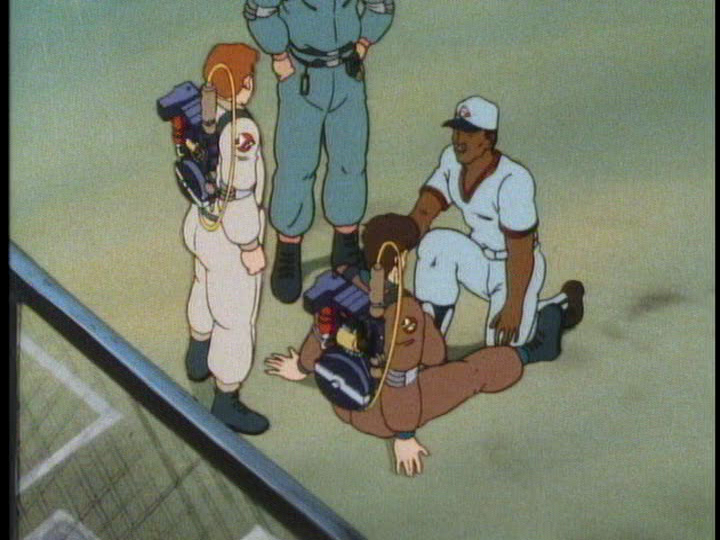 Rather painfully, Peter, who crashlands first into this other world, gets a back-breaking double-whammy of Ray and Egon directly onto him. 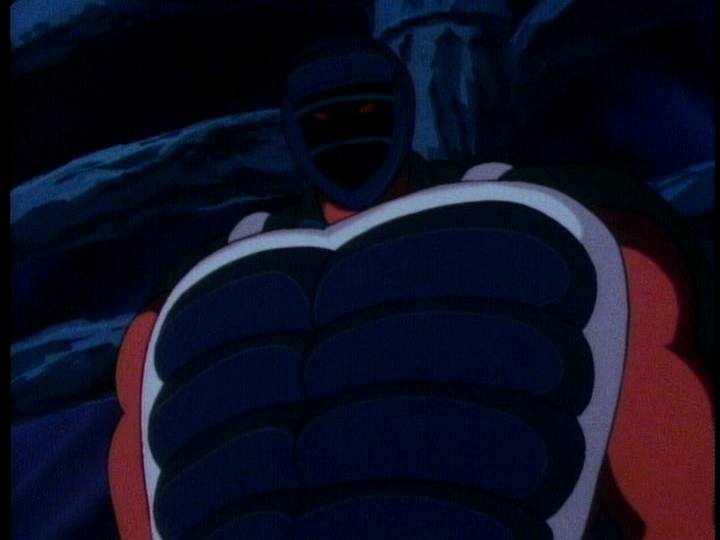 Never mind, there’s more immediate concerns at hand than any potential spinal damage, as one look up alerts to them to the presence of an ABSOLUTELY HUGE GHOST with red skin, a massive chest shield and what looks like an umpire’s mask, albeit with glowing red eyes lurking behind it. ‘Uh-oh!’, the guys say in perfect unison. The music is NONE MORE PORTENTOUS, and this could be the most alarming end-of-act break ever, except that when we come back after the ads, he turns out to be a stern but reasonably fair character indeed. 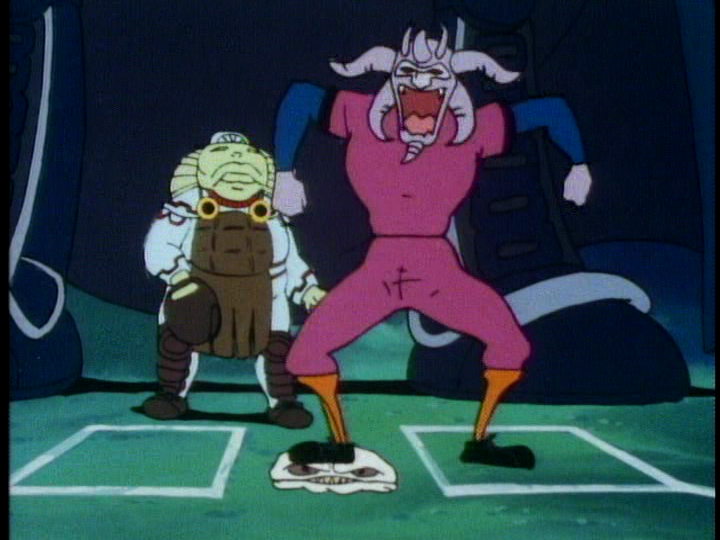 ‘YOU DO NOT BELONG HERE!’ bellows the umpire (voiced by Maurice LaMarche sounding like Egon if he was a All-Conquering God), quite reasonably I think, since the guys blasted their way uninvited into this whole situation. By the way, the second act begins with the same ‘uh-oh!’ the first act played out on, which some shows do when they come back after the ads – you know, recapping a few seconds earlier just to remind us where we are, but it always feels weird when you watch it on video or DVD and essentially the same thing happens twice in a row. 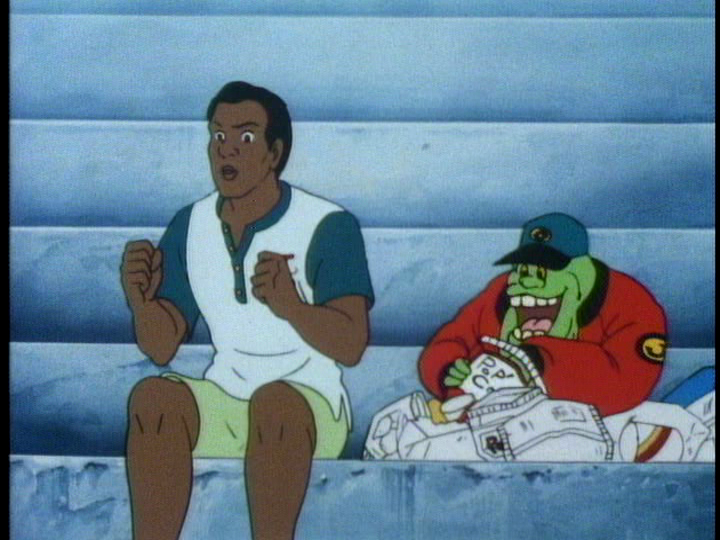 The guys wonder where Winston is, and he shouts out that ‘they made me short stop!’, and this where we realise that they’ve gatecrashed a baseball game, albeit one with ghosts as the players. 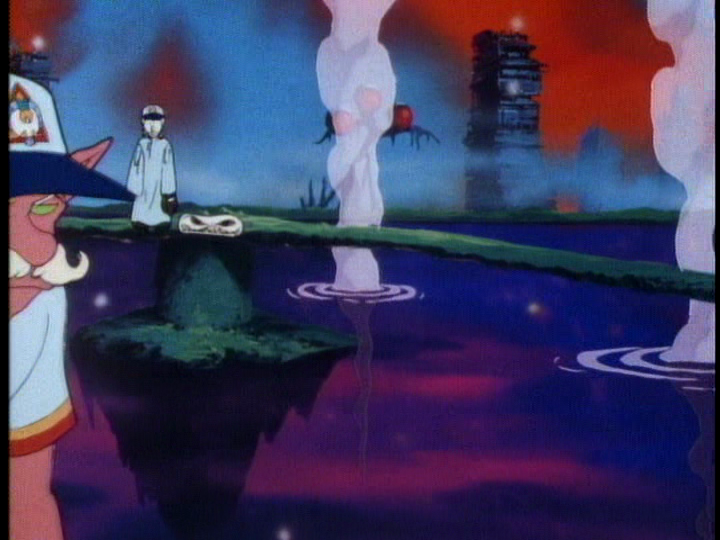 All of a sudden, the potential horrors have given way to something more light-hearted. The pitch itself is amazing – you can even run on water here! Still, this will be no joke of a second act, not when a human soul is what’s at stake. Turns out that the battle for this soul will always be appropriated by whatever the surroundings are at the time, and in this case, it’s baseball. Peter gets all flustered as why all this brou-ha-ha has taken place if only for just one soul, and this is where the umpire gets very angry and demands just what on Earth is more important? He really gives it to Peter here, and I agree with him. Peter would too if he knew just who’s soul (500 years in torment for good measure) was at stake at this point, but lets move on. Anyway, the game is already underway, so it’s too late for the other three to join the team, but after some consideration, they are allowed to stay and watch. Remember though, when good and evil battle, no one can be neutral. Remember that. What a nightmare! So good is on pitching duties, and the snake that catches the ball spits it out with such venom that it literally goes through the pitcher, dissolving him on impact, and in a lovely visual, bounces along the water pitch. I must note at this point that each stop on the game looks like a sandwich with eyes and a mouth that squirms whenever it’s stepped on. More evil trickery takes place when one of the batters appears at virtually every stop to confuse the fielders, blagging his way to a point and cackling like a madman as a result. Git. Good aren’t doing so well, one poor, and very elderly batter is struck out in lightning time – the jump cuts to the umpire’s fingers as he rolls off the strikes boasts a cool use of editing. Winston takes a moment to talk to the guys and they try to reassure him that they’re not worried about their man, even though they really are. 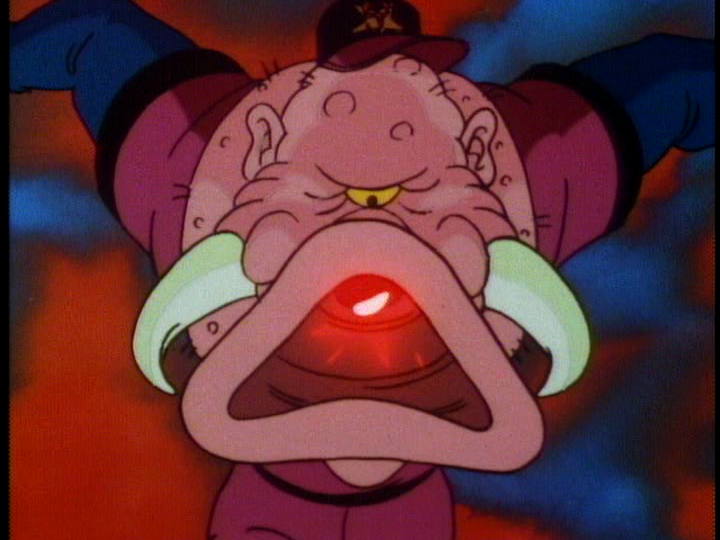 The game starts to pick up and Good gets a point in, and this is where Evil pull out their secret weapon is the form of an absolutely huge pitcher who resembles a one-eyed pink elephant that can shoot the ball out of its trunk at such an alarming rate that it appears to bend shape. He’s too good. Evil have won. Haven’t they? Maybe if the next batter is any good they might have a chance. Uh-oh, it’s Winston. Winston, whose favourite team, lest we forget, are the worst team in baseball history. The umpire has his doubts. So do the guys. What can they do to help? Why, destroy the pitcher! Of course! I must say the umpire is a bit of a git for hinting as much, slyly directing the guys towards what could be the worst move they ever make. Peter and Ray tool up and get ready to fire – meanwhile Winston has been struck out twice, the second instance knocking over by the strength of the serve. Egon however, is thinking…. when good and evil do battle, no one can be neutral….NO ONE CAN BE NEUTRAL! Egon stops Ray and Peter just in time to helpfully inform them that if they cheat, good loses, so I guess they’ll just have to see if Winston can do it on his own, and as dramatic tension dictates, it’s always the third time that’s the charm, and then some. Despite the ball being hurled towards him with such violent force that it seems absolutely impossible for anyone to defeat it, Winston completely kills it, sending the ball back with equal/greater strength so fierce that it sends the pitcher flying backwards into the air and into the scoreboard, utterly destroying it in the process. It takes a while for the good guys to realise that Winston has just won the game, after which they cheer like nutters. Winston home runs it, and all of a sudden things get all Raiders of the Lost Ark as Evil’s disciples all start to melt horribly, albeit in bloodless fashion – lest we forget, the ending to Raiders is probably the most extreme ending to a PG film ever, and I’m glad we don’t get an attempt to an outdo it here. What follows is a sombrely eerie moment as the good team vanish one-by-one. It’s a triumphant moment on one level, yet the spooky music and the sudden desolation of the pitch makes for a strange mood. Eventually it’s just the guys and the Umpire, who suggests the real players in this game were the Ghostbusters, and in their decision to refrain from interfering with the result and letting good win on its own terms, they sealed the fate of that mystery soul, who it turns out was never Winston. It was Peter all along. Peter struggles to come to terms with the fact that he almost blasted his way to 500 years of torment, but in the end has a nervous breakdown and collapses in the middle of the stadium (which has now returned to sunny, daytime normality) while all the others laugh around him. Ho-ho-ho. Thinking back, it would have been nice of Winston to inform Peter a lot earlier that it was his soul that was under threat. What a git. Next time, we end up all at sea, thanks to Peter’s dad.